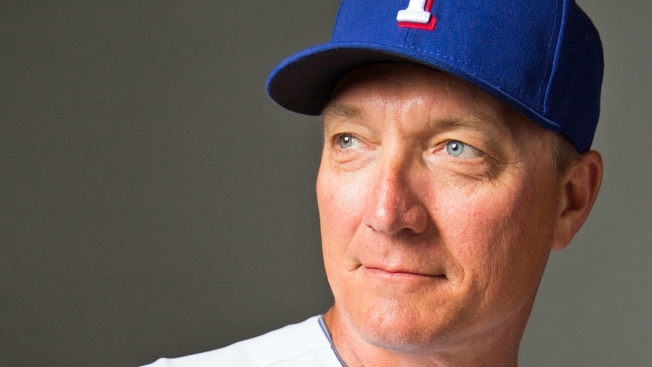 SURPRISE, AZ - MARCH 2: Manager Jeff Banister of the Texas Rangers poses for a portrait during photo day at Surprise Stadium on March 2, 2015 in Surprise, Arizona. The Rangers weren't flirting with being the victim of a no-hitter in Friday's home opener against the Houston Astros, but after seeing what transpired that day at Globe Life Park, the Rangers would've gladly taken another owning from Sonny Gray. It all started when Derek Holland, the de facto ace who the Rangers were relying on to get them 200 innings, threw just nine pitches before exiting only to find out later that day he would miss at least two months with a shoulder injury that can only be fixed by rest. That was obviously the biggest gut-punch of the day, but it wasn't the only one. Just an inning later, Shin-Soo Choo was mysteriously replaced in right field by Jake Smolinski, and a quick look on Twitter from my seat in the park revealed Choo was suffering from back spasms and was ruled day-to-day. Choo, of course, was back in the lineup on Sunday as a late pinch-hitter, so the hope is he's going to be OK. But that wasn't it. A couple of innings later, Delino DeShields Jr. mysteriously replaced Ryan Rua in left field after he'd sprained his ankle during his at-bat the previous half-inning. Next thing you know, Rua is on the 15-day DL. Are you kidding me? The 5-1 score that day was just a subhead on the disaster of the day, with Holland's injury obviously being the biggest blow. We thought 2015 was going to be better, and so far it's been a big letdown.